Wicked rock/pop with an occasional punk/funk attitude. 4. What Is the American Dream? 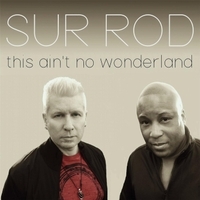 SUR ROD is a Nashville duo – writer/singer Rod and musician/producer Audi – whose collaboration began in 2011, bringing Rod's stockpile of demos and unfinished songs to life. This led to the debut 2015 album, SURRODsound, a collection of songs that are the essence of their creative process to date. Before the new record was available, a single from the album, "What Is The American Dream?," had been added to independent radio stations' playlists in various markets. The core of Sur Rod's sound is rock; influences range from darker artists from Marilyn Manson to rock's greats (Stevie Nicks/Pat Benatar) -- all with a punk attitude to keep the integrity intact. Rod and Audi also leave the door wide open, allowing funk and pop influences to showcase Rod's impressive vocal range. While Rod handles the majority of the writing, Audi arranges the songs and produces the recording sessions. This new album is much more collaborative, as half the songs were co-written by the duo. This Ain't No Wonderland summarizes Rod and Audi's musical partnership to date, but it is only a small dynamic of what is to come.